So thanks to @-PUNISHΞR- for informing me about questions being raised to the usage of 2 installers in some of the old repacks. Q. Why setup.exe and setup2.exe have different sizes, one small and the other larger ? A. Both installers are based on completely different engines, one is Inno and the larger one is Delphi (ASC by Razor12911). Q. Why the usage of 2 installers anyway ? A. Thats for the sake of users, in case one installer fails (Popuar Inno ISDone errors), the second one will work. And fortunately it has actually helped many users in succesfully installing the repacks. There are cases when ISDone errors popup randomly and you just don't know what is causing that to occur. So unfortunately helping users by providing 2 installers can be harmful at times. Idiots like these are dumb enough to consider BCM as a bitcoin miner tool often found in FitGirl repacks, which it is not. BCM is a context mixer (CM) compressor and not a bitcoin miner. @ShivShubh Some of the FG repacks also have two installers (one for Intel and one for AMD processors which is slower on installation). But no one makes any fuss over that , instead they let FG blame AMD for their processors rather than admitting her/his own fault ! Which sounds absolutely ridiculous to me. Whereas CorePack doing the same thing turns up so many conspiracy theories (bitcoin miners, virus, end of the freaking world !!!). What has this world come to ...unbelievable ! I don't think any of her repacks contain Bitcoin miner but neither do ours , period ! I SWEAR THEY LOVE HER RPACKS ONLY BECAUSE fit"'GIRRRRRLLLLL"
Idiots like these are dumb enough to consider BCM a bitcoin miner tool often found in ******* repacks, which they are not. They are context mixer (CM) compressor. ^ come on man, you are supposed to be the grownup here. don't go accusing without proof. Proof for what ? I am not accusing FG for having bitcoin miners instead I am saying her repacks doesnt have miners. I read comments about FG repacks a while ago on CrackWatch about having miners. Turns out they were talking about this tool called bcm.exe which is a context mixer compressor and not a bitcoin miner tool. ^ come on man, you are supposed to be﻿ the gr﻿ownup﻿ here. don't go accusing without proof. If you don't know what to do and what is a mining software and how to detect it then here is the good thing for you? How to tell if your computer is secretly mining cryptocurrency, and what to do about it? Your computer could be secretly mining cryptocurrency—piggybacking on your computer’s processing power to confirm transactions and generate new and potentially lucrative coins—and you wouldn’t even be profiting from it. 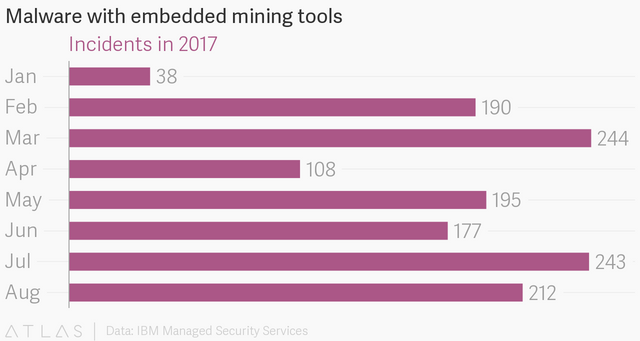 Incidents of malware containing crypto-mining tools have surged six-fold this year, according to IBM Managed Security Services. Here’s how to find out if you’ve been unwittingly committing your computing power to enrich someone else. Open a resource monitor on your computer to check if CPU usage is abnormally high. On a Mac that’s Activity Monitor, and on Windows it’s Task Manager. If you see a spike in CPU usage when visiting a particular website that shouldn’t really be that taxing on your processor; or if you have everything closed but CPU usage is still super high, then you may have a crypto mining malware problem. It’s hard to say what “normal” CPU usage looks like, since computer processing power and the applications people run vary so much, but a suddenly elevated level of CPU usage would indicate an abnormal increase in demand for processing power. Your computer can be hijacked for mining by visiting a particular website or having an infected advertisement displayed in it, as researchers at security software vendor ESET have detailed. Ad-blocking software can also filter out known types of in-browser miners. One such mining script is called Coin Hive, which isn’t necessarily malware. It can be embedded in websites without the knowledge of a visitor, although its developers encourage website owners to disclose the script’s presence to users. One ad-blocking software, AdGuard, will scan a site to see if Coin Hive is running on it and alert you to it. AdBlock Plus, a browser extension, suggests adding a filter to its built-in blocking options that targets Coin Hive. Researchers at IBM have found a more sophisticated class of surreptitious mining software that penetrates your system. These are delivered through infected image files or by clicking on links leading to a malicious site. Such attacks tend to target enterprise networks, IBM found, so get in touch with your IT person for help. If your system is infected, you should detect a degradation in performance, in which case fire up Activity Monitor or Task Manager to check your CPU usage. You can then identify the process that’s eating up all those compute cycles and terminate it from your resource monitor, says Dave McMillen of IBM Managed Security Services, who authored the research on secret crypto miners. Are these things mining bitcoin? No, because bitcoin requires far too much computational power to be mined profitably this way, even if millions of ordinary computers were hijacked. Bitcoin miners today operate vast data centers containing thousands of machines specifically built—down to the chips—for mining bitcoin. Instead, these miners most commonly try to generate Monero, a privacy-centric coin with a current market value of $1.3 billion. Like other cryptocurrencies, it has surged in value this year, from around $15 in January to a high of $140 in early September. ** but sometimes 'superfetch' also have high memory usage.......is there any remedy for it??? ** but sometimes 'superfetch' also have high memory usage.......is there any remedy for it?? keep uu CP you have speed install great.